"Greeeeeeetings, boils and ghouls! It's your old pal, Creepo here, everyone's favorite master of scare-i-monies! Today we're creature-featuring a new point-and-click adventure from Carmel Games. Or should we call it a pain-and-crypt deadventure? Well, when patrons start disappearing from a local food court, just as a killer new burger stand gets hideously popular, a competitor's employee decides that he's hungry for answers. But what he unearths may put him off red meat for good! It's Creepo's Tales: Chopping Mall, and trust me, kiddies... it's a meal to die for!" Thank you, Creepo. Gameplay is standard for the genre: click around to interact and pick up items, clicking on something once it's in your inventory to use it or to combine it with another item. The map in the lower right will guide you to various locations around town. Carmel Games has steadily improved with each of their adventure game releases, and Creepo's Tales: Chopping Mall continues the positive trend. The story may be horror, but the cartoon art and quality voice-acting keeps things comedic. The puzzles have generally sensible solutions, and even the few that don't should pose no problem to anyone versed in adventure game logic... though just once, it'd be nice to, when faced with an antagonistic hungry person blocking your path, get them to move through reasoned conversation, rather than tricking them into eating something gross. Creepo's Tales: Chopping Mall could stand to be a little longer, and the twists of the story are fairly predictable, but classic adventure game fans should find it an entertaining way to fill a lunch break... because man, they probably won't feel like eating afterwards. Creepo's Tales: Chopping Mall Walkthrough now available! After the opening cutscene, you'll be in the mall's food court. To the right of Mike's cash register is a stack of burgers. Take one. Talk to the woman behind the counter. Wow, what a jerk. Give her the burger. Well, that didn't help you in any way. Grab another burger; you'll have to do something else with it. 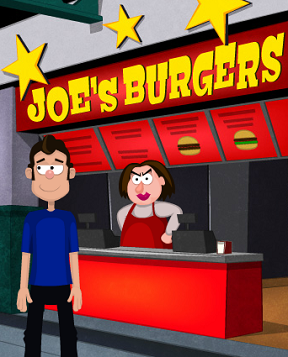 At the far right end of the counter for Joe's Burgers is a napkin dispenser. Take a napkin (you'll use it MUCH later). You can try to go behind the counter at Joe's, but the woman will stop you. Instead, leave the food court by clicking the arrow on the right. This is an overview of the Shoppin' Mall. The food court you just left is on the top floor. Just below it are the gift shop and fruit shop, and just to the left of them is the door to the security room. Below that is the door to the parking lot. Go to the security room. Take the empty cup (by the computer to the left), the crowbar (just below), and the broom (by the exit). Leave. This time, go to the gift shop. The woman running the counter here isn't particularly helpful. At the left edge of the screen, just above the yellow boxes, is a lever. Pull it to take care of the woman. That was... oddly convenient. Click the sword. Hmm, you need some help reaching it. Use the broom on it to get it down. Leave. Go to the fruit store. Wow, look at those prices. At least the pumpkins are reasonably priced. Click the leftmost pumpkin to buy it. Leave. Now let's check out the parking lot. There's an X on the floor for some mysterious reason, and a door you can't open. Nothing else to do here. Click the map in your inventory to leave the mall and go to the outside world. There are a few different orders we can visit these locations, but let's start with the burger ranch. Wow, talk about tough competition. Use the crowbar on the boards to remove them, then go inside. There isn't actually much worth clicking on here. Check the trash can for some hot sauce. Open the map again and go to the wax museum. Enter the museum and look around. That locked door is conspicuous, isn't it? Check the poster on the wall by Mike. Hey, that's the same woman as from the ticket booth... and that's a magic square! For those of you who are bad at math, the missing numbers are 5-10-11. Try that as the combination for the door. It worked! Go inside. The only thing you can take is the headless mannequin, so do so. Open up the map again and go to the gas station. Go inside and talk to the man at the cash register to get some donuts. Open up the map again and go to the police station. See the table towards the right side of the screen? The one marked "FOR POLICE USE ONLY"? Stick the donuts on it to distract the officer. Check the folder on the counter. Aha, so THAT'S what the X was for! Leave. It's finally time to return to the Shoppin' Mall. Go to the parking lot. Maybe we can set some sort of trap for the kidnapper. Combine the pumpkin with the headless mannequin to make a scarecrow. Stick the scarecrow on the X and watch what happens. ...Well, I guess bait isn't very useful without a trap. Oh well. He dropped something, so it's not a total loss. Take the key. Return to the food court. It's time to put an end to this. Put the rotten sauce on the burger, then give the result to the woman at Joe's. Yikes! She needs water. Go to the restrooms (to the left of Mike's) and fill the cup at the faucet. Return to the food court and give the water to the woman. Hmm, that didn't do much good. Go to the restrooms again. Check the toilet; it's clogged and disgusting. Take some water from it with the cup. Give the dirty water to the woman at Joe's and she'll pass out. Now there's nothing stopping you from going behind the counter, so do exactly that. Not much to see... hm, what's with the keypad by the fridge door? It needs a key, so try the one the kidnapper dropped. It fits... which proves a lot. Now, the code. Remember the napkin you picked up? Examine it; it has the phone number of Joe's on it. That seven-digit number is the code. Enter it and the door opens! Watch the cutscene where a reveal you probably saw coming occurs. Now we need to take care of Joe. See the rope above the keypad? Apply the sword to it. Game complete! It'll probably be days before you can stomach another hamburger, though. Humourous little game. Always been a fan of the lighter side of point-and-click. Might add that the "Comments or Questions about Creepo's Tales: Chopping Mall?" link just links back to the game itself. Tales from the Crypt anyone? where is the key and code...???? cant find it..